Discussion in 'Civ3 Strategy Articles' started by ButSam, Dec 29, 2001. Expansion is the key at the beginning of the game, and that affects the rest of the game VERY much. I have tested this tip a few times...all on Regent level, and on Standard or smaller maps, Continents and Pangaea with 70% and 60% water...I assume it would also work on 80% water, since that just lessens the land--a good thing for this tip. For archipelagos, modify it to build around the ocean on your island first, but the same idea holds. Alright, here is my small stroke of genius that seems to give me a MUCH better (10+ cities on a Standard Continent 70% Water map with 10 civilizations is about the average number I was able to get BEFORE fighting/taking over a single city!) start in the game. This works VERY well (and was tested) with a religious civ, but would work (to a somewhat lesser extent) with others as well. (I promised I would play a religious civ, and I did--love the benefits so much!) Expansionist would probably help some, but I'm not sure that it would help as much as a religious civ. All tests were on Regent, and I heard the computer gets bonus units at the beginning of the game on higher levels, so it may or may not work on higher levels...but the general idea still could hold to some extent...just build a bit closer to your initial cities. Explore in all directions until you find a civ, and then explore their border extensively. Build your first two (or three) cities while you are doing this exploration. You will likely bump into a civ that wants to limit expansion by expanding toward you as fast as possible...but they do it from the INSIDE (center of their empire) OUT, instead of the OUTSIDE IN! Take advantage, and learn from their mistake--build from the OUTSIDE IN! What does this mean? Starting near THEIR BORDER (a fair compromise between their border and where you think you can reasonably blockade with your borders--5 tiles away from their borders seems to work if you are able to produce a bunch of settlers at once...but it really depends on how many settlers you can produce right away, how long it will take them to get there, and how long the border is you are trying to seal) and working TOWARD your cities, from the OUTSIDE in, all the way around. Build new cities, and have them build Temples immediately. (I took along a Warrior or Spearman for defense. When? While waiting for the city size to build up so I could build Settlers.) Basically, you want to build so your border CUTS OFF the expansion of the rival civ. Make it so that the lakes, oceans, bays, and other civ borders cut off your rivals from expanding. Also, build it so you will be at least one city radius away, but no more than one square beyond a city radius, so your cities do not overlap but have little, if any, left-out space. (The idea is after the Temple expansion, the border will become solid and sealed.) You may not get all four sides if you are in the worst position (surrounded by rivals on all sides in the middle of land) for this tip, but you WILL do better than building from the center out! The importance of Temples is to quickly expand your borders so it takes many fewer settlers, while also increasing happiness! Now that you have established this barrier, the very NEXT task is to build all around the ocean. Why? The computer may not have built boats up to now, but soon it will take to the seas and look...so now secure that as your own. Using this method, I could effectively "stop" the computer's growth, then fill in the gaps. By the way, you had best research Monarchy IMMEDIATELY, since corruption will be high for your outer cities, but that's something that can be dealt with more AFTER the expansion phase! I'm not talking about making your initial empire radius be 50 tiles on a Standard map...make it about 15 - 20 tiles in radius from your initial city...of course, if there is no rival civ that close, start on the outside of a 15 - 20-tile line from your city, and build up and down that...then you can fill in the gaps when you have sealed your borders. If you are not able to stop the entire side of a civ, don't worry. Start from the middle and work up and down, so you can still handle it if you don't cut off the ENTIRE border...you still will have cut off at least some of it! Once again, SATISFY THE DEMANDS OF YOUR RIVALS--don't GIVE them a reason to attack, since your border cities are initially somewhat weak, and your efforts focused on expansion. AFTER the Temple, build another defense, then you can have the border cities contribute to further expansion on the borders, and expansion back toward the interior cities. I found the computer will not attack right away if you keep it happy...and will respect your borders, even if they are a militaristic civ...EVERYONE is focusing on expanding at first, and if they bump into a wall, they will try other means! Just be sure to cut off the oceans after you seal off a comfortable radius on land...you want to do this BEFORE you see boats, or it is too late! This usually isn't that tough, but be sure to do it before mass-producing workers and other stuff, and before settling in the parts of land you skipped over by rushing to the "outer limits"! I am going to go give it a try. 1) If running a scientific civ - build libraries (for the same cost) instead of temples you get to expand your borders 1 turn earlier (3 CP vs 2 CP). 2)I don't bother with Monarchy. Corruption is not helped greatly by it and with Despotism the coin of the realm is people. Food supply is not hurt by corruption and with despotism you can spend population to speed build your culture producing improvements. Temples and libraries generally never cost more than 2 pop units unless you try to build immediately. The best case is to have one or two cities with one or two of the terrain improvements (wheat, cattle, flood plain) that makes more than 2 food. This city can pop out workers at a pretty good clip. The workers are sent to the new cities to quickly build population which is spent on the culture-producing improvements. A supply of 4 workers can build a temple and library in 4 turns even in a city making only one measily shield per turn. Is this tactic useful on higher difficulty levels? Good luck to all, and remember to expand from the outside in! I'm not sure about higher difficulty levels but I can comment a little about bigger map sizes. There have been several different versions of "Outside in" strategies posted here before so I've been using something similar for a while (cruder though!). The main thing to watch seems to be getting the balance right about how much territory you decide to stake out as "yours". When I've got just a tad too greedy the AI seems to get wise to what I'm up to and appears to deliberately nip round me (or even straight through) and mucks up the pattern. It can also backfire if you back the wrong civ into too tight a corner too early (and when you plan your layout you often don't have a full picture yet of how much territitory the others occupy. Naturally the cost in roadmaking etc is higher initially, but you seem to get the benefits back later. I've tried this style and its opposite - suggested by someone who was playing on very high difficulty levels - the capital and suburbs approach. That involved putting a tight overlapping ring of "suburbs" close in round your capital. 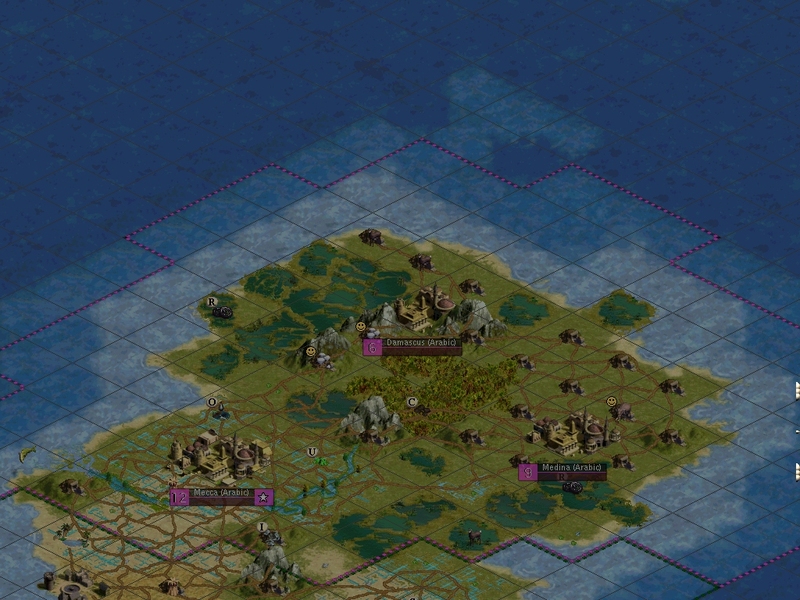 Both approaches seem to work OK, so it probably boils down to picking the one that best fits the map you're on, and which matches your own style of game play - like most things in Civ3, no "one size fits all" answers. Thanks for your post - I'll definitely try out your naval refinements, as I am a great neglecter of navies. Wow! I used your strategy on a Large Regent game and it worked really well. I started out on a mid-sized continent shaped like an upside-down Y. The Germans and Babylonians shared one angle of the Y, and the English had the other. I had the straight part. I immediately ran my settlers to the fork in the Y and built three cities, enough to have my culture block the openings. I then developed the inside with cities, etc. until I had about 10 of them. Then, the English attacked around 1 AD! However, because I had fortified the outside cities anyways, they were no match for me (especially after I called upon the services of Hammurabi and Bismarck). My two allies took all of their cities but my culture has so far gobbled all but one up, now in 1730 AD. Expanding from the outside in has, no doubt, given me an almost sure victory. The three others on my island would have walked right in and settled in prime new city positions, but they didn't, because of my culture. Thanks for the great tips! Your strat works perfectly...I've been playing since CivI and it never occurred to me (this'd work even without culture). BTW - Polonius, you can combine both the suburbs and outside-in strats. Build your capital in a good location, then walk your settlers/scouts/warriors outwards a bit and built a city. Then, once you have a border established, you can build your suburbs. This strategy has been propounded elsewhere in significant detail (see any of Vel's threads here (if you can find them) or Apolyton (if it ever gets back up) for the REX approach). Of course the reason it has appeared multiple times is because it is such a good idea . Like the wheel and other seminal advances, it's discovery will be repeated many times. And that is what these forums are for, the spreading of good ideas throughout civilization as we know it. Polonius raises some good points, as always . In my current game both the Greeks, very early, and the Egyptians, early Industrial Age, slipped settlers through my not yet closed border (I build to have closed borders at 10 culture points) as I tried to hem them in / block them. It is a real pain to have those cities inside your borders and a threat as well if your now 'external' cities are closer to the AI's capital than their now 'internal' city is to yours. Don't assume the AI won't respond to this tactic, or possibly, even use variants itself (yes the AI usually expands from the centre out but I have seen many lonely AI cities placed for what are obviously longer term/strategic considerations - usually spots that I am trying to get a settler to myself). One final topic I want to add to this thread - map size. The smaller the map, the easier this strategy is to implement. A fully expanded map has almost 20 times the tiles that a tiny map has. Even with an expansionist civ, it will take time to find the other civs and even longer to get settlers/roads to the border-to-be. The nearest civ is often 50 or more tiles away and while the tactic remains valid, it has to be implemented somewhat more conservatively and usually from a core group of good cities. It is foolhardy to build a new city 45 tiles from your capital and 5 from his with nothing but wilderness in between. It will be very vulnerable and your 'border' will be porous for a long time. Pick intermediate spots which are excellent city sites and use these cities to build the settlers/units for the future border/ blocker cities and as Polonius notes, don't get too greedy or it will cost. Judging just how much one can bite off is one of the many challenging and fun aspects of this game - much better than the previous incarnations where the AI expansion was much less competitive. Eventually the civs will meet, normally on the axis joining the respective capitals and then it usually becomes a 'race to the sea' as you try to outflank each other / turn the corner (like the Germans/Allies in France in 1914). There is a lot of room on the bigger maps for this type of maneuver and the AIs play this very well. The city/suburb idea I believe is also map size dependent, working better for smaller maps. One of the long term goals on bigger maps is to control a lot of land containing, optimally, all the terrain types - which of course makes the outside in expansion technique a winner. The reason one needs such a large empire is that if there are 20 times as many tiles, then the 'density' of strategic and luxury resources is 5% of that in tiny maps, i.e. the absolute number of these resources is independent of map size (meaning there will be, e.g., 10 iron tiles whether there are 3600 (tiny) or greater than 60,000 (fully expanded) total tiles). So the outside in expansion pattern is valuable for all map sizes, although the actual tactical application must differ. On small maps, space is at a premium and defining your space as early and as advantageously as possible is critical. The relatively small distances also make this approach relatively simple to implement. On larger maps, space is pretty abundant but one still needs to identify as early as possible viable borders for your civilization and then create them as soon as possible. The main differences are the scales of implementation - time and distance. On small maps, your 2nd or 3rd city may well be a blocker/border city and it may not yet be 2500BC. On huge plus maps, you will have 50+ cities in the ADs and still be finalizing some border somewhere (before looking overseas for other opportunities). Thank you again for adding to the idea, and expounding on it I agree--all games are different, which is what makes Civ 3 so FUN, and REPLAYABLE...and now with so many ways to win as well...it just plain ROCKS THIS WORLD!!!! One thing I noticed (this dealing with Standard maps or smaller...and I only know FOR SURE it works on Regent and smaller) the expansion thingy should make it so your borders are sealed WELL before the Industrial age, so you then have one contiguous empire. Of course, I build almost exclusively settlers...even before defenses...and Temples (for a religious civ) or Libraries (as pointed out above, for a Scientific Civ, by the Good Doctor) are the FIRST thing (above defenses) to build; that's why it is so important to satisfy your opponents' demands (unless they demand a city, of course). DON'T build more than one or two workers (TOTAL...NOT per city) at the beginning; focus SOLELY on settlers. You should (again, on a Standard or smaller map) find your borders sealed tightly--just as long as you also build all along the coast, then fill it in. Only AFTER filling in (or when there is spare time waiting for the city size to get high enough) should defenses be built. The odds of being attacked at the beginning of the game when you keep up diplomacy are very small. Try giving that a shot--it may seem crazy, but I am living proof it works! Of course, if you are not by a militaristic civ, that helps...if you are, you may have to give some stuff away...but expanding rapidly more than makes up for it. The point--it may sound ludicrous, but go ALL-OUT Settlers, and then build TEMPLES first (or your most quickly built improvement that gives culture). If you are playing the Babylonians (Religious and Scientific), I suggest going for Temples since they also give happiness...an added bonus. Give that a shot--your borders should be all but filled in even before you switch governments to Republic...on a Standard or smaller map...oh and also important to note I tested with 10 Civs on a Standard, 8 on a Small, and 6 on a Tiny (to go for the crowdedness factor)--yes, I made it so I could include more civs on each map. As I said, I was going to give this strategy a try and it worked great. I played on a Pangea type map. Instead of having a few large sections of land connected by smaller areas like I expected, I got stuck with a big blob, which gave me some problems. I started expanding, and I surrounded two of my opponets. I ran into a problem here. I was only able to surround them in a U shape so they were able to expand outwards from the U. I thought I completely screwed the strategy up, but I continued to play. I noticed that the strategy helped me take over a larger amount of enemy cities than I do when I dont use it. By 1400 AD, I took over 2 small, 2 medium, and 1 largely populated city by my culture. By the time I got into the 1900's, I took over about 3 other cities. With the strategy I was able to cut off the expansion of two civilizations, the Japanese and English. I also tried to cut of the Bablonians but I wasn't able to do it. Both the Japanese and English had under six cities by the time I decided to invade them in the 1500's. I also notice that the strategy helped while I was trying to take over the cities. I was able to attack from both ends on the inside of the U. This really made it easy to take over the cities. I still need to work on my skills and play on a different difficulty level, but this strategy has helped me out a lot. It's worth a try. i havent tried your theory but im not sure how it would work. the ai tends to walk right through my land, at any point in the game, even without right of passage. telling them to stop results in them promising to leave and then continuing on their path. the only solution is to block them with units, if they find themselves blocked they usually turn around. barring that, settlers will treat my teritory like their own. I am finding the same thing, the AI settlers just walk straight through my borders. Admitedly on the map I have been playing they have no where else to go as they have completely expanded to the ocean. I do find that because the AIs Cities are far apart I gobble them up quickly with culture because I completely surround them. But my sealed borders do not stop them. I did that once, and the settler appeared on the opposite side of my civ! That civ was the first to go. Even worse, in my game, the computer sent a settler into my terriotory, asking it to leave and it left, but it left to the other side instead of going back! Thanks for all the input and help testing this idea! Here's my modification (sorry, it won't let me on as ButSam anymore, so I had to create a new ID). this strategy is historically justified too. When the United States was moving westward in the 1800s, people would go ahead of the core US boundary and establish towns/colonies/small cities in disputed land and wait for the US to conquer the land and catch up to them. This is one of the reasons why the US now holds Mexico. pity this busy monster manunkind not. At the beginning look at the world map on the corner of the screen. Locate your position and expand to the center of the map. If you're at the center, choose a direction and expand there while sending a unit to explore the other side. 1.Your starting worker must build a road to your future 2nd city right from the start. 2.Your capital must produce a defender then a settler. 3. Your 2nd city should have 3 tiles away so a unit from your capital can move in 1 turn. Build the city and produce a defender. 4. Your capital and succeeding cities must continue producing in a defender/settler/defender/settler order. Forget temples or other improvements for now. You should have at least 8-10 all-garrisoned cities by 2000 BC. (Huge map, continents) Then start hurrying temples everywhere. After that, make your core cities produce workers and fighting units while the outer cities continue to produce their share of settlers. If they lack enough food, simply send those workers to add them while core cities produce some more workers. Your workers must build roads as they move at all times. If you want a worker to add to a city that is not connected by roads, build the road as you go. This can delay the unit very much, but its definitely worth the effort. The next unit will pass that road in an instant, not to mention the commerce benefit. "There was a dream about Rome, you could only whisper it. Anything more than a whisper, it`ll just vanish." I always use this strat. Next game Im gonna try using it with the Temple of Artemis. So I can culture expand super fast.